Greenhouse gas emissions in 2007 amounted to 20,722 kilotons CO2 equivalent, which is 1.8% above the base year. In accordance with Slovenia's commitment to achieve an 8% reduction in its emissions, an average emission of greenhouse gasses in the 2008-2012 period should not exceed 18,726 kilotons CO2 equivalent. The indicator shows the movement of the total quantity of greenhouse gas emissions in Slovenia and the main categories of sources. The calculations are based on the IPCC methodology (Intergovernmental Panel on Climate Change). 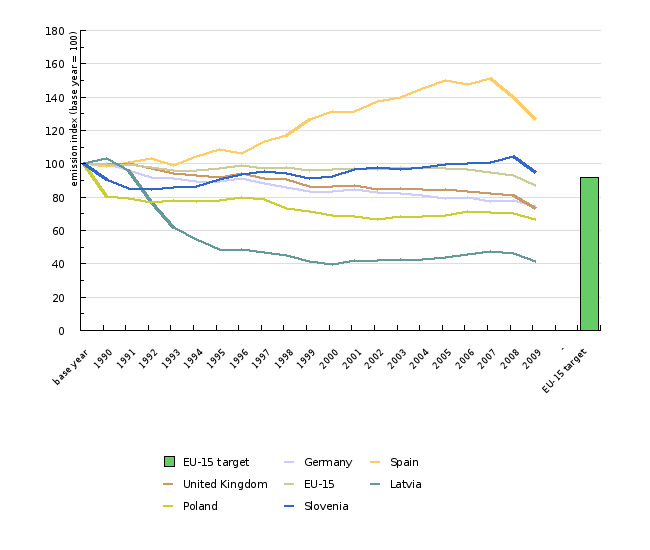 Based on the Slovenian ratification of the Kyoto Protocol, which requires an 8% reduction in greenhouse gas emissions in the 2008-2012 period in comparison to the base year (1986), the indicator also monitors the movement of the global quantity of greenhouse gasses and offers comparison with the EU-15 and the EU-27 countries. In accordance with the international agreements, emissions in the base year are the sum of CO2(carbon dioxide), CH4(methane) and N2O (nitrous oxide) emissions in 1986 and emissions of F-gasses (HFC - hydrofluorocarbons, PFC - perfluorocarbons and SF6- sulphur hexafluoride) in 1995. Emissions in the base year were determined on the basis of the situation recorded in the emission records in July 2007. EEA Technical Report 7/2007, Annual European Community Greenhousegas Inventory 1990-2005 and inventory report 2007; GHG Archives, Environmenmtal Agency of the Republic of Slovenia, April 2008. The greatest contributor among the emissions of greenhouse gases in 2007 was carbon dioxide – CO2 (82.0 %), which results mainly from fuel combustion; the second largest contributor was methane (10.5 %), mostly deriving from wastes and agriculture, and third was nitrous oxide – N2O (6.4%), deriving from agriculture as well. Traffic-related N2O emissions have also been observed. Emissions of F-gases, which include hydrofluorocarbons (HFCs), perfluorocarbons (PFCs) and sulphur hexafluoride (SF6), are very small (1.1%), but due to high greenhouse potential, their contribution to global warming is far from insignificant. Emissions of greenhouse gasses in 2007 amounted to 20.722 Gg (gigagram=1000 tons or kilotons) CO2 equivalent. This is 1.9% above the value in the base year. The quantity of emissions in the base year was finally determined in 2007 for all the signatories of the Kyoto Protocol and can no longer be changed. For Slovenia, the total quantity of emissions in the base year is calculated as the sum of CO2, CH4 and N2O emissions in 1986, and emission of F-gasses in 1995, which amounts to 20,354.042 Gg CO2 equivalent. In accordance with the obligation from the Kyoto Protocol, which requires an 8% reduction in emissions, average emissions in the 2008-2012 period in Slovenia should not exceed 18.725,719 kt CO2 equivalent. In order to fulfil the obligations arising from the Kyoto Protocol, it was therefore necessary to introduce additional measures to help us achieve the prescribed value. The majority of them are described in the Operational Programme for the Reduction of Greenhouse Gas Emissions, which was adopted by the Government of the Republic of Slovenia in 2006. For the reduction of greenhouse gas emissions in the area of energy production and consumption, the Energy Act was adopted in 1999, and the National Energy Programme (NEP) was drawn up as well. Both of these documents envisage a sustainability-oriented development of the energy sector by enhancing the effectiveness of energy as well as using renewable energy sources. The table below presents these measures. In 2005, one of the three most essential Kyoto mechanisms began functioning, i.e. trade in greenhouse gas emissions. In 2008, 98 installation operators from Slovenia were included in the trading system. In the EU, emission trading was introduced in 2005; at the global level, it is to be introduced in the 2008-2012 period. Another additional measure in the traffic sector is the implementation of measures from the Transport Policy Resolution, which envisage rerouting the transit from roads to railways. Although total emissions have not changed significantly in comparison with the base year, there is a considerable change in their distribution by sector. The highest increase in emissions in period 1986-2007, a 175% rise, occurred in traffic emissions. Due to road traffic, the total amount of greenhouse gas emissions has been increasing by more than one per cent a year, which diminishes our efforts to curb greenhouse gas emissions in all other sectors. A greater amount of emissions from traffic is mainly the result of economic growth in Slovenia as well as in the wider region. The growth of emissions due to transit through Slovenia, which rose substantially after the country entered the EU, has also been observed. In light of the loss of the Yugoslav markets, abandonment of non-profitable production and increase in productivity, the manufacturing industries contributed the largest share towards curbing greenhouse gas emissions. The decrease occurred both in emissions arising from fuel consumption and processing emissions. For the purposes of maintaining competitiveness, trade in emissions and the IPPC Directive, the industrial sector is encouraged to make use of the currently best available technology (BAT). The IPPC Directive on integrated pollution prevention and control requires the EU Member Countries to issue permits for process installations in all industry sectors. Integrated pollution prevention means the reduction of emissions into the air, water and soil, rational use of raw-materials, reduction of noise, and greater energy efficiency. Lower emissions than those in the base year are also noticed within the agricultural sector, which is mostly a result of reduction in the number of livestock units. The future projections anticipate that the number of cattle will again rise due to quotas determined for Slovenia. On the other hand, agricultural policy will, by introducing good agricultural practice in fertilising and establishing biogas consumption for electricity and heating production, influence the reduction in agricultural emissions. Forests cover more than 58% of Slovenia’s land surface and constitute an important source of reducing GHG emissions. Calculations of CO2 sinks are considerable due to land use change and forestry. In 2007, CO2 sinks reached 5,774 Gg of CO2, exceeding a much lower permitted level. On the basis of the condition stipulating that these sinks must be a direct result of human activity so that the state may use them for the purposes of fulfilling its obligations, an assessment was selected according to which it will be possible to make use of at least 1,320 Gg of CO2 during the period of 2008-2012. Objectives summarized by: Resolution on National Environmental Action Programme 2005-2012 (ReNPVO, Official Gazette of the RS, No. 2/06). Source database or source: GHG Inventory. GHG Archives.Environmental Agency of the Republic of Slovenia. Data administrator: Environmental Agency of the Republic of Slovenia, Tajda Mekinda Majaron. Methodology and frequency of data collection for the indicator: The data is presented for the 1986-2007 period. The majority of input data for the calculation of emissions was collected from the Statistical Office of the Republic of Slovenia database. This data contains mainly information on fuel consumption and the associated calorific value and data from the agricultural sector (livestock numbers, output quantity and use of fertilisers). Data on vehicle fleet and the number of kilometres driven for the calculation of emissions from road traffic was obtained from the Ministry of the Interior of the RS and the Slovenian Roads Agency. Other input data was collected from the Environmental Agency of the RS databases. This is mainly the data on emissions trade and solid waste management. To a lesser extent, data was also obtained on the basis of individual agreements with producers or consumers. Data is collected annually and can be updated for past years when necessary. Data processing methodology: Greenhouse gas emissions are calculated on the basis of IPCC methodology, developed under the UN Framework Convention on Climate Change. Greenhouse gas inventories data was prepared on the basis of the IPCC methodology (IPCC 1996, 2000). Bearing in mind the importance of the source and available data, various approaches were used (Tier) within the IPCC methodology. To evaluate emissions from fuel consumption, national emission factors were taken into account for CO2 emissions from domestic lignite and natural gas, whereas adopted IPCC emission factors were used for other fuels. Emissions from road traffic were calculated by using the Copert III model. In fugitive CO2 emissions in the energy sector, emissions released in the desulphurisation of flue gasses in thermal power plants were considered. These emissions were calculated on the basis of information on the use of carbonate. Emission factors for fugitive CO2 and CH4emissions in mining were determined on the basis of measurements in the Slovenian coal mines. CH4 emissions in the transfer of natural gas were calculated on the basis of data from the company that uses a transmission and distribution network. Losses in distribution were estimated on the basis of the length of individual types of pipelines in relation to the type of pipeline by using specific losses per unit of length, as mentioned in the German report to the Conference of the Parties, which makes sense if we consider the level of maintenance and the low average age of the pipeline network. Industrial process emissions were mainly determined on the basis of data that was obtained directly from producers or through emissions trading and by using national emission factors. Methane emissions due to intestinal fermentation in cattle were especially precisely determined in the agricultural sector. A more precise approach was used to calculate emissions from animal manure in pig and cattle production. The Tier 1 approach was used when calculating methane emissions from the keeping of other animals, which produce less methane emissions. When calculating N2O emissions from manure and direct emissions due to fertilisation with animal manure, input data was used, which was obtained from methane emissions estimates. Adopted IPCC factors, which determine the transformation of nitrogen into N2O, were used when calculating N2O emissions. Methane emissions from solid waste management were determined with the use of the first-order method, which takes into account the time dynamics of methane release. N2O emissions from wastewater were determined on the basis of protein use in human consumption, which did not change according to the estimates during the period in question. - Advantages and advantages of the indicator: The correctness of calculations and the appropriate use of information is monitored by the Convention Secretariat with annual revision reports. Data flow is in accordance with the requirements of the UN Framework Convention on Climate Change, the Kyoto Protocol, and the relevant European legislation (Decision No. 280/2004/EC of the European Parliament and the Council concerning a mechanism for monitoring Community greenhouse gas emissions and for implementing the Kyoto Protocol, and Commission Decision 2005/166/EC laying down rules implementing the previous Decision 280/2004/EC). Emission calculations from the field of fuel consumption and partly from industrial processes are relatively precise, whereas estimates from the agricultural sector are significantly less reliable due to the nature of the process itself. The total unreliability of greenhouse gas emissions calculations in the base year (1986) was 8.5%, and 7.3% in 2007. Source database or source: Data for the EU-15 and EU-27 is taken from the technical report of the European Environment Agency, No. 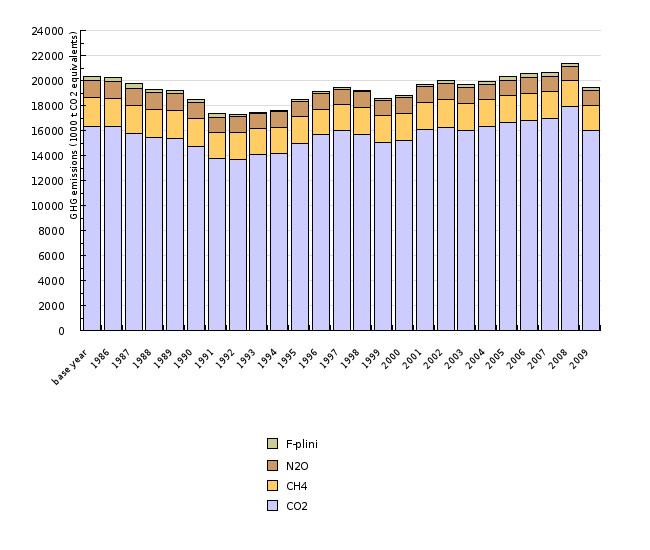 4/2009 (Annual European Community greenhouse gas inventory 1990-2007 and inventory report 2009). 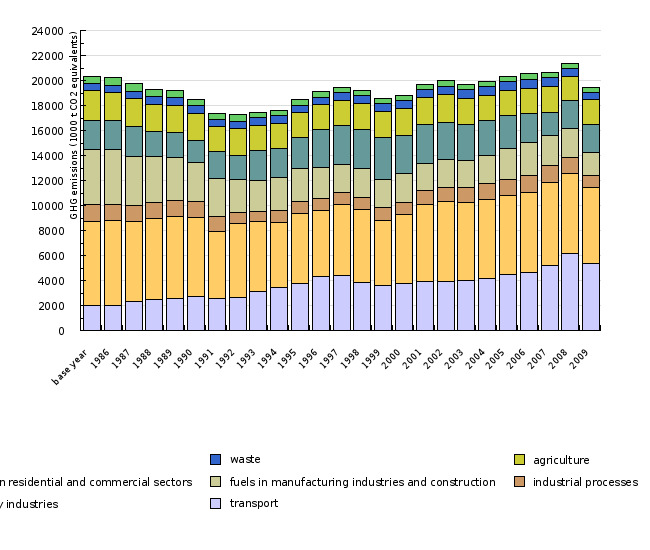 http://www.eea.europa.eu/publications/european-community-greenhouse-gas-inventory-2009.. Methodology and frequency of data collection for the indicator: The data is presented for the 1990-2007 period. European greenhouse gas inventories are calculated as the sum of emissions of all Member States and are presented separately for the EU-15 and the EU-27. Data is updated once a year for the entire 1990-2007 period. Data processing methodology: Greenhouse gas emissions are calculated in a similar manner in each Member State, as the states must use one of the IPCC methodologies. - Advantages and disadvantages of the indicator: The correctness of calculations and the appropriate use of data is monitored by the Convention Secretariat with annual revisions of Member State reports and the Community report. Data flow is in accordance with the requirements of the UN Framework Convention on Climate Change, the Kyoto Protocol, and the relevant European legislation (Decision No. 280/2004/EC of the European Parliament and the Council concerning a mechanism for monitoring Community greenhouse gas emissions and for implementing the Kyoto Protocol, and Commission Decision 2005/166/EC laying down rules implementing the previous Decision 280/2004/EC.